There's a reason why Robert DeNiro is considered one of the greatest actors of all time, and it's because when he's really taking a role seriously, there's no one more intense, entertaining, and honest to watch. If you look at all of his great performances, it comes from that intensity and frustration with people that he has, he doesn't want to put up with people's BS and even when he's doing comedy, it comes from that same scary place. So you can only imagine how he reacted to reading a bunch of insults people made about him on Twitter. He might be getting up there in age, but I don't think I'd ever have the balls to say any of those things to DeNiro's face. Also, I wouldn't want to, the man made The Fan a great movie. THE FAN. I rest my case. It just goes to show you how much bravado people gain when they can hide behind an anonymous screen name. 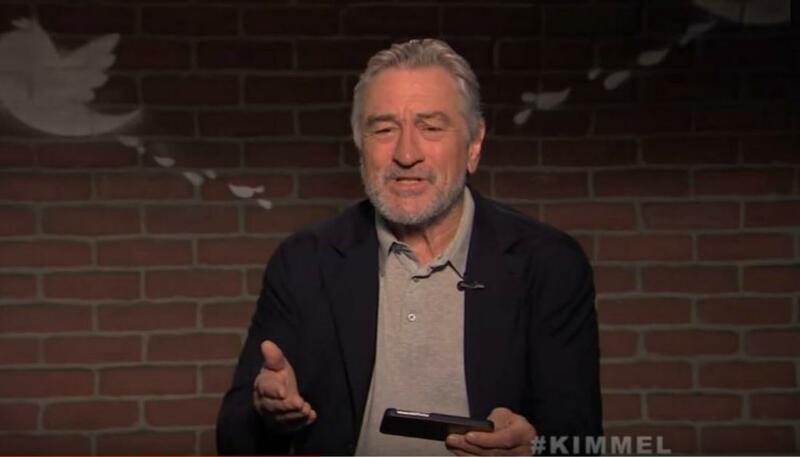 I guarantee none of those people would have anything but gushing praise to say about Bobby DeNiro if they ever met him in real life. Not just out of fear (this is the guy who played Travis Biggle in Taxi Driver, after all), but out of respect. The man is a living legend and universally respected by his peers, directors, and film critics. Even when he agrees to make yet another Fockers movie. His face does kind of look like he smelled a fart sometimes, though. But I say that with nothing but respect for the man. If I acted as well as Bobby and had the kind of credits and accolades he has under his belt (Goodfellas? Raging Bull? The Godfather Part II... are you kidding? ), I'd have a permanent stank face, too.